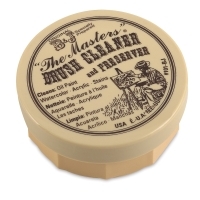 The Masters Brush Cleaner and Preserver removes oils, acrylics, watercolors, stains, and varnishes from the finest sable and bristle brushes, and makes painting with nylon and other synthetic brushes a snap. Just wet your brush and work up a lather on the hard cake. Simply wet with water, swirl, lather, and let the brush sit a while before rinsing. Even old, hardened oil paint brushes can be restored to their original snap and luster. Your brushes will be reconditioned to perform like new. The Masters Brush Cleaner and Preserver gives off no harmful fumes or odors, and it's safe for use in the classroom or studio. ® The Masters is a registered trademark. 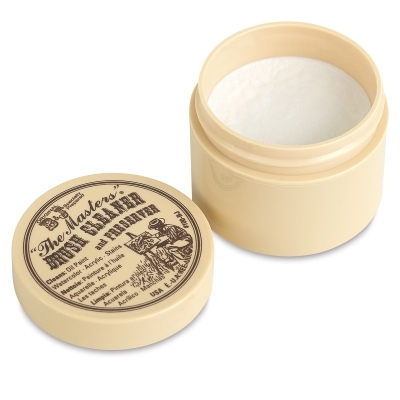 Just wet the brush and work up a lather on the hard cake. Even old, hardened oil paint brushes can be restored to their original snap and luster.